Why This Ashstead Garden Cabin with Shed Should be for Your Home & Family. This Trentan ‘Ashstead’ log cabin with a shed attached with its modern design is perfect for relaxing in your garden with your family. And its design lends itself to a multitude of uses for all your family such as a leisure room, a fitness room, a den for the children or even an office. The list could go on as the quality and good design of these log cabins are included as standard. That’s where the ‘Ashstead’ scores on all fronts Its design allows it to blend into your garden and has the strength for long life. And now comes with the new DGP+ doors and window. These include double seals, European furniture (NOT Chinese) and the doors will have adjustable better hinges, left-right, up and down, 3 hinges on each door. 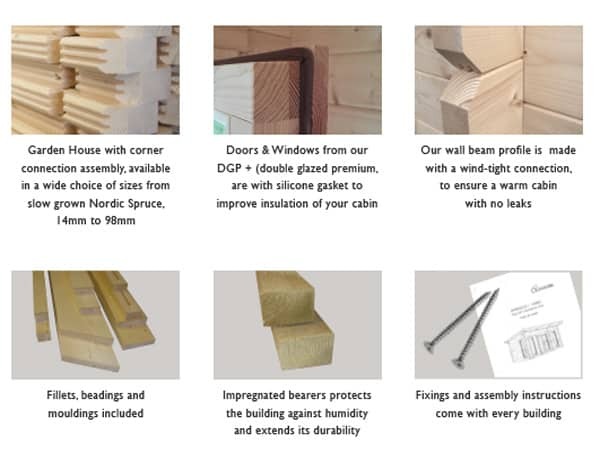 The superb Nordic slow growing timber these buildings are made from means that the strength is built in. The Swedish style comes from their way of life and the modern design ensures that this ‘Ashstead’ log cabin is a very special cabin. The modern design will sit nicely in your modern home band with the superb log cabin with storage shed will be an asset for you and your family. It’s important to ensure that the quality of timber is ‘top-notch’ and that not ‘cheap and nasty’ materials are used. Some log cabin shed combination buildings even use chipboard or OSB boards which is 100% unsuitable. 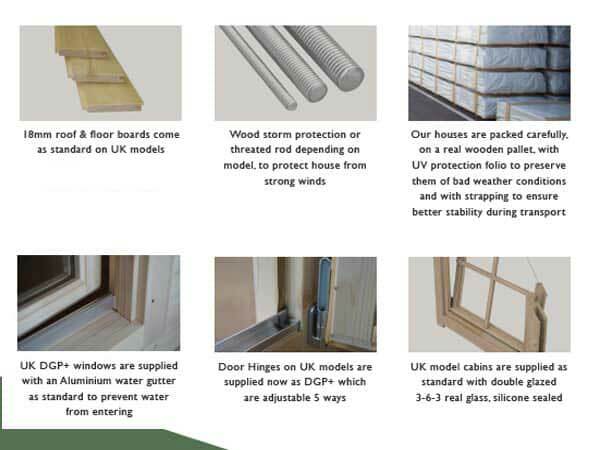 The doors and windows, incorporating the new DGP+ grade, are designed for long life. Fully double glazed to keep the building as warm as possible. Added strength comes from part laminated materials which help to stop any twisting or warping which you may find on cheap cabins. With fully adjustable hinges everything has been thought of to ensure the very best for you. The timber ‘naturally’ comes from renewable sources. The clever design of these log cabin with side storage building is such that they slot together very easily. and this comes from the pre-assembly of them beforehand to ensure all parts fit correctly. All the parts of the building are dismantled and have bar codes added to aid assembly. This means that when you come to assemble them it’s all falls into place easily. However, if you would rather someone else builds it for you – then no problem. We can arrange the erection of these log cabins with a store so that all you have to do is to sit and enjoy the completed building when finished. That’s got to be a good thing? The ‘Web’ is a wonderful thing and never fails to amaze me. You will find the quantity of log cabins, some with stores, which you can find is immense. So the question is – how do you know what you are buying? Well, the best way is to actually view examples ‘in the flesh’ so to speak. Our large display site is perfect for this purpose and you can see examples of these superb buildings. Take a drive out and walk inside the log cabin so that you can get a good idea of how it would sit in your garden and how you would use it in your life. By being ‘touchy-feely’ with it you can be sure it will meet your needs. Don’t risk just buying from a leaflet or computer screen despite how good they may look. 1st Choice Leisure Buildings is a family business started in 1979, so you can also be sure that we understands the requirement to make wooden cabins to a standard and not DOWN to a price. Our Ethos is to ensure quality reigns over cheapness and to date has been the right policy. 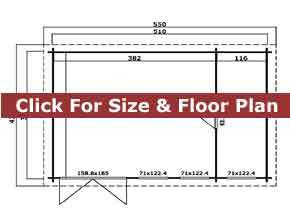 Size: 5.1m x 3.9m (17ft x 13ft nominal). Ashtead Apex Cabins or Gable Style. Note this is the external size of the body of the cabin. The lugs extend 100mm on each corner making the overall size (as most other companies quote) 200m larger. We mention this so you know you are comparing ‘eggs with eggs’. Approximate clear internal size will be approx 5.0m x 3.8m. Please check with us if internal size is crucial. Main room is 3.9 x 3.9m (13 x 13ft) and side shed annexe 3.9 x 1.16m (13ft x 3¾ft). Cladding: Standard interlocking logs are 40mm thick and slot into each other. The log profile has designed wind-tight connections to ensure a superior resistance against wind. Untreated. Kiln dried timber from sustainable sources. Floors: 18mm thick T&G untreated boards used on these Ashtead wooden floors. No chipboard, OSB or other cheap sheet materials used on the floor, unlike some other suppliers. Floor joists are 70x45mm and are normally spaced no more than 650mm apart. All floor joists are pressure treated for long life as standard. Doors: Joinery quality contemporary double glazed double doors 1588mm wide x 1850mm high (62½in x 72½in) – approx sizes into main area. Also solid single door, 835 x 1850mm (33 x 72½in) into shed annexe. Easy adjust hinges complete with gasket seals, fitted silver finish door handles, cylinder lock and two unique keys. Low doors sills giving you easier access into your log cabin. Supplied untreated. Beware of doors with single glazing or excessively high door sills. 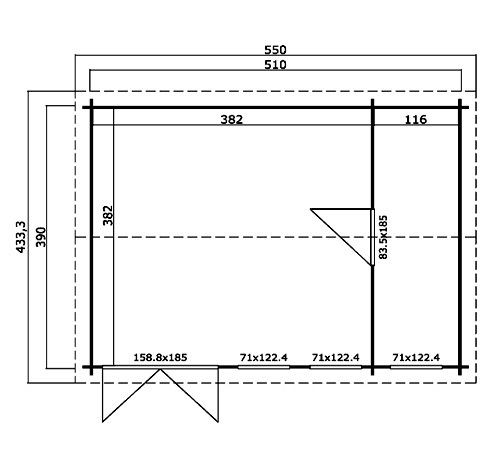 Windows: Three (3) Joinery quality inward opening windows included as standard. Size of each window is 71cm wide x 122cm high (28in x 48in). Complete with easy adjust hinges, silicon gasket seals and delightful silver finish window handles. Supplied untreated as standard. Double glazed as standard NOT single glazed. Georgian window bars included free as standard. Lower Walls: Height: 2110mm (83in) – all Ashtead log buildings. Ridge Height: Height. 2514mm – on all Ashtead cabins. Treatment: All cabins are supplied untreated so you treat to suit your needs. Erection: These are supplied in kit form for self assembly. Option for assembly through a third party if required. If being built you would require a concrete base or solid and level paving slab base. Optionally, we have an option for building a timber base for you. These buildings are assembled by interlocking the panels for ease of taking it down again if you decide to move. Delivery: All units are delivered and HIABed off the lorry for you free of charge throughout central England and Wales. Deliveries to Cornwall, West Wales and Northern England would cost an extra £100. Deliveries to Scotland would cost £150 extra. This Ashtead Log Cabin with shed with its combined shed storage area ensures you have the answer to more than one problem in your garden. The sheer functionality is just one of the reasons to choose this cabin for your garden so give it some thought. Choice of Georgian or Classic style. However before committing your money it’s a good idea to see examples of log cabins to see the quality. Take a trip to our Log Cabins display in Surrey to see for your self. Don’t risk buying ‘blind’. These Nordic wood cabins are fully double glazed for comfort and under 2.5m tall for planning.